Our holistic approach uses a combination of exercise and diet to complement medical and interventional pain management skills. Is there a Way to Avoid Facility Fees? Spend less with affordable care and high-quality pain management treatments in a cutting edge facility. We aim to help you get back to an improved and quality way of life with a less invasive way of living a healthy and pain-free life. 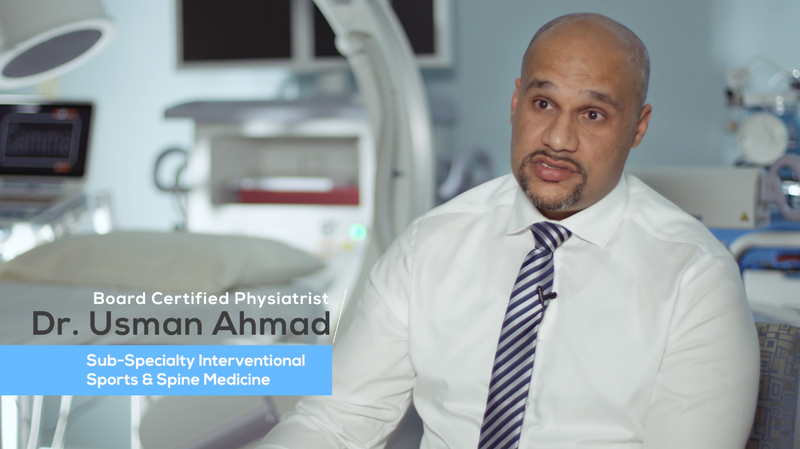 Dr. Ahmad Usman has a sub-specialty in interventional sports and spine medicine. He works with a professional team of clinical staff. Specialized procedures to control your pain. At Advanced Sports & Spine, we have the best physiatrist in Charlotte, NC. We put our patients first. We provide a holistic approach to help alleviate pain and discomfort. To establish continuity of care, you will always see the same physiatrist during your clinical visits. Our goal is to find the origin of pain. Once the cause is identified, we utilize a combination of exercise and diet to complement medical and interventional pain management sessions. We aim to help you get back to living your life with improved function and quality of life as quickly as possible. At Advanced Sports & Spine, the majority of procedures are performed in our medical office. Our pain management facility is equipped with state-of-the-art medical equipment. We use both ultrasound and fluoroscopic guidance to ensure accuracy. This can also help limit complications and increase success rates. With procedures being performed in our private office, our patients pay less compared to having the procedure performed at a hospital. We also ensure less wait time in a comfortable environment. Our office is conveniently located in the Arboretum Office Park at the intersection of Pineville Matthews Road and Providence Road. Visit the best physiatrist and pain management clinic at 8035 Providence Road Suite 340, Charlotte, NC 28277. Personalized patient care is what sets Advanced Sports & Spine apart. Dr. Ahmad and his caring clinical staff provide you with an exceptional health care experience. Schedule an appointment today! Copyright © 2018 Advanced Sports & Spine. All Rights Reserved.